Wayfinding signs and tools are like breadcrumbs, feeding information to users as they travel to their various destinations. Too much signage content, however, leaves travellers feeling overstuffed with information, to the point where navigation becomes an exercise in frustration. Beyond helping people not get lost, wayfinding should provide a logical, pre-determined pathway of data, clearly communicating what belongs on a given directional sign. Every signage or wayfinding system should rely on a hierarchy of information that delivers an increasingly specific level of detail as visitors move closer to their destination, whether piloting a vehicle, exiting transit, or accessing a location on foot (or motorized scooters). Upon initial approach, the sequence of information leading people to a destination begins with signage on a highway, state route or main road. Whether a city, university, or venue, only “high-level” names appear on these signs – the name of a city, university, or major venue. Just imagine the confusion of driving past a sign at 60 mph that lists every potential destination at a given exit. Wayfinding content should be based on visitor count for the most highly trafficked spots, and the order in which they’re listed on the sign is generally determined by proximity, or which destination will be reached first, second, etc. While pedestrian signage characteristically contains more information than vehicular signage, an overly cluttered sign can still leave a negative impression. For instance, ground-mounted building signs for a university has the primary purpose of identifying a building, so design should be simple and legible, including only the name and/or address of the building. Too much information on a sign interferes with visual comprehension and fails to generate that all-important hierarchy of information a first-time visitor requires. There a few exceptions to the rule when a second-level destination may appear on the sign because it’s a highly-visited place, such as an auditorium or admissions office within a building. When we plan a wayfinding project, our philosophy is to start with general information (when people are farther away) to more specific information as visitors get closer. In other terms, the only content on a sign should be the most critical info for that moment in the visitor’s journey – the information that someone needs at that juncture (rather than all the potential destinations ahead). The Cleveland Indians tasked Guide Studio with structuring a wayfinding strategy at Progressive Field. The previous signage oriented fans to exterior street names, but once inside the park, those exterior landmarks are not helpful because you can’t see or reference them. The new system was designed around the concept of “districting” (zoning) so fans could orient themselves inside the stadium rather than use exterior street names. 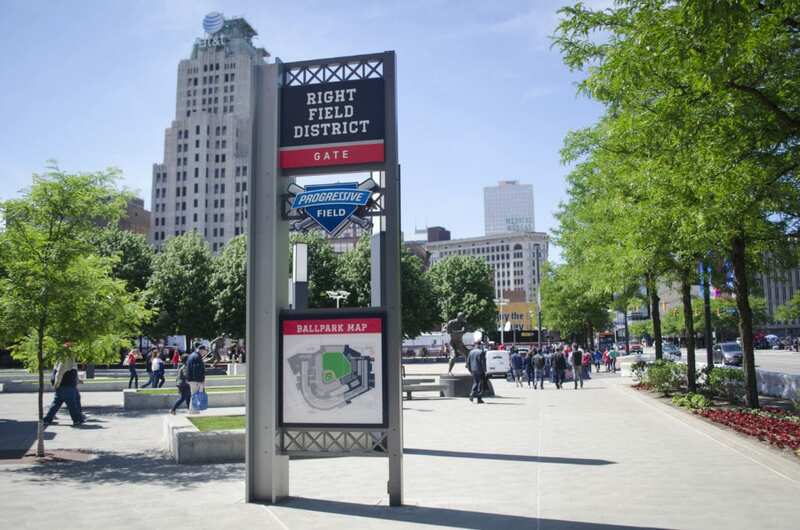 The new signage system walks visitors through the entirety of the Progressive Field journey, from their initial approach to the stadium to key interior stops such as concession stands, escalators, restrooms and team apparel shops. You wouldn’t want to walk into the ballpark and immediately be directed to one of the many hotdog stands. By putting yourself in the “visitor lens,” you can imagine what that experience could and should be like (i.e. first find your seats, then find the nearest hot dog stand). Sign messaging also considered ongoing park renovations, with easily replicable standards that would keep updates in future consistent with the new signs. In other scenarios, you may be looking at tiers of wayfinding that include both vehicular and pedestrian or other types of signage. Cleveland’s cultural epicentre, University Circle, is home to some of the city’s most prestigious museums, universities and healthcare facilities, attracting a diversity of visitors on a regular basis. The district needed new signage to easily guide visitors through the winding urban streetscape. In response, Guide Studio identified critical decision points where signage would be particularly beneficial, giving travelers needed information without encumbering the district with excess signage. Ultimately, the proof is in the feedback: Visitors to University Circle have remarked on the updated sign program’s effectiveness and their ability to traverse the neighborhood with ease. You also see it in the vibrancy of the area – traffic is a result of the number of people who are flocking to the destination, not because they can’t find their way. Following a systematic plan that included map kiosks and other forms of vehicular and pedestrian navigation, the plan now points people to the historic neighborhood’s top visitor destinations as deemed by a contingent of community officials. This is practical because, unlike most businesses, museums and universities are not typically moving locations, so their permanence warrants real estate on signage. When developing a signage project, it’s critical that you meet with district stakeholders – largely business owners, school administrators, public officials, etc. – to discuss which spaces attract the most tourists and residents. The stakeholders are the experts of their place, so it saves time and effort to involve them in the planning process upfront. And while you may be worried that they will each want their organization or business represented on a sign, you can avoid that challenge by establishing and communicating signage policies beforehand. It helps keep signage visually compelling and representative of the district’s brand. It serves as both rationale and a reference for selected sign content. This kind of team approach provides us with the necessary information to plan the wayfinding system that addresses that specific client’s needs and goals. There is no one-size-fits-all wayfinding plan – each community or destination has their own challenges and opportunities that are taken into consideration with wayfinding. By working with our clients and their stakeholders, we can understand the primary objectives; perhaps they want to lead visitors directly to a destination in the most efficient manner possible, maybe they want to provide drivers an alternate route around a highly congested area, or purposely guide them through a downtown so they are more likely to peruse shops and restaurants. Whatever the goal is, it can be addressed with a strategic wayfinding plan. Many communities and institutions are finding innovative means of directing pedestrians to wherever they may be headed. A comprehensive wayfinding program built upon a breadcrumb trail of easily digestible data will keep hungry visitors coming back for seconds. Get in touch with us to learn more or add us a team! Despite demand for digital everything, physical signs have held their position as one of the most important brand tools. From brick-and-mortar businesses and large corporations to cities and parks, every organization needs signage. Not only is it the face of your organization, but it works for you 24 hours a day, seven days a week, and compels people to connect with your establishment.